Korea enjoys a rich culture, made up of a mixture of deeply historic elements alongside modern aspects like the blossoming K-pop world. Visitors to Korea can enjoy a variety of cultural and modern experiences unique to this fascinating country. Read on for ten fantastically unique products that can only be found in Korea. K-pop, or Korean pop music and culture, is taking the world by storm, and is largely responsible for the burgeoning popularity of Korean dramas. Television dramas like Descendants of the Sun have enjoyed worldwide popularity, and Korea knows how to capitalize on the unexpected popularity of its pop culture. K-pop merchandise can be found almost everywhere in Korea, but the real treasures lie in licensed souvenir shops run by major entertainment agencies. While socks are certainly not a uniquely Korean item, the prevalence of sock-buying opportunities and the wide range of colors, designs, and characters available undoubtedly is. And they're not just targeted to children, as wearing socks emblazoned with favorite characters or even political figures is commonplace for modern Korean people too. In fact, sock buying so common in Korean culture that sock vending machines can be found in popular areas of Seoul. Much like the "kawaii" culture in Japan, Koreans love anything tiny and cute. Many cute items can be found throughout Seoul and other parts of Korea, from tiny teddy bears and dolls to intricate miniatures on keychains, and trinkets to attach to bags and cell phones. As an offshoot of Korea's "cute" culture, the selection of cell phone cases available to purchase is almost unrivaled in Korea. The range of cases in the United States is a tiny proportion of what is available in other parts of the world, so it makes sense to bring home a selection of cell phone cases for yourself and as souvenirs for friends and family. BB Cream is one of the hottest beauty items on the market today, and by all accounts its popularity will only continue to rise. With BB Cream being a uniquely Korean invention, it is little wonder why people are exporting it in all its forms around the world. But the Korean beauty market is so much more than BB Cream, with facial packs being another common and inexpensive item in Korea. In addition, a selection of strange and unusual beauty products can be found, from jaw massagers to double-eyelid tape, and antibacterial hand wipes to facial slimming masks. Back to the traditional, the hanbok is for Korea what the kimono is for Japan. And just like in Japan, Korean men and women still wear their hanbok with pride during celebrations and social occasions. Visitors to Korea can order a custom-made hanbok, however they don't run cheap and can take up to three weeks to made. As such, a variety of hanbok dolls and teddy bears are available for sale at various places throughout Korea, which have proven to be popular keepsakes. Soju is the Koreans' alcoholic drink of choice, and like much of Korean culture, has become so popular overseas that the most well-known soju brand, Jinro, has been known to outsell other popular liquors in the United States. A clear liquid like vodka, soju is typically made from rice and is considered to be quite bitter to taste, and not as strong as vodka. Soju was traditionally made from rice, until rice shortages from the mid-1060s until the turn of the century caused the government to prohibit the use of rice in soju distillation. Creators needed to become inventive, and even today soju can be found with a tapioca, barley, wheat, or sweet potato base. The more expensive brands are once again made from rice, and soju that has been aged ten years in oak barrels carries a premium price. Masks have long featured in Korean culture, in royal courts, battle uniforms, ceremonies, and rituals. Today, traditional Korean masks still play a role in re-enactments of traditional plays and ceremonies, and as good-luck charms. Korea has a strong tea culture, with a variety of traditional and newer teas available. Meshil (sweet plum tea) and omija (five taste tea) are traditional variants that are still widely enjoyed today, while jakseolcha, an expensive form of green tea made from only the young buds of the leaves, is a firm favorite. Koreans have been making traditional paper, known as hanji, for thousands of years, and the tradition still endures today. Made from the bark of the mulberry tree hanji was traditionally used to over the windows, doors, and walls in Korean houses, but today is more commonly used for artistic purposes including stationery, paper dolls, and lamps. Folding fans have long been a part of Korean culture, with their use being considered essential, even in colder weather. Folding fans are widely available for purchase, and have traditionally been used as props in Korean dances and performances, providing shelter from the elements, and even to hide a person's face from onlookers. Which of these products would you be most interested in bringing home from a trip to Korea? Are there other quintessentially Korean products that should be included on this list? Have your say in the comments below, and please like and share this article. There are many good Linux distributions out there so how can you know which is the best? I have personally pondered over this a lot, trying what I feel to be the 3 main distributions, Redhat, Mandrake and SuSE and I have finally decided that SuSE is the best for me, however you may not agree. Below is a simple outline of each distribution. Redhat: This is probably the best-known distribution especially in the US and Europe. You can get Redhat for free online or if you need the support or more advanced features you can purchase it. Depending on the package you buy will depend on the amount of support you use. Redhat is best used on servers especially web servers, it isn?t the easiest distribution and isn't well known for its desktop use however version 8 tries to bring that gap closer with its new GUI. SuSE: SuSE is aimed more at the desktop market and is by far the easiest to install and configure which is why it is my personal favourite. I would recommend SuSE to any first time users because of its simplicity and easy of use. SuSE also does a power pc version for anyone wanting to install on a Mac. Because of the way SuSE is you cannot download ISO images from the web however you can download the individual files. Linux-Mandrake: Mandrake is probably the easiest distribution for new users in the way that it is easy to learn. It has little features that add to the usability of the operating system. You can download mandrake from the web but the package is more then good value to buy. Mandrake was the first distribution to offer a games package that includes games like The Sims. Slackware: Slackware boasts to be the ?original Linux?. It?s not easy to install or configure and is defiantly not for the noobie. Slackware is great if you want to learn the inner workings of Linux especially if you want to become a Linux system administrator. Slackware is probably the ?geekiest? of all the distributions and it will be very hard to get to use, but in the end you will have a more personalised operating system. Debian Linux:Debian Linux is one of the only fully free Linux distributions; there is no company behind Debian just a lot of dedicated open source programmers. Debian is very good for development purposes and many people use Debian to learn programming. In my view Debian is behind the rest of the distributions however it is still very popular. There are many other good distributions including Caldera, Gentoo and Turbo Linux however I find it best to stick to the more popular distributions, as you are more likely to be able to find any support needed. I find the hardest thing when it comes to Linux is choosing your distribution, as there is such a large choice and things are constantly being improved from hundreds of different projects through out the world. The system requirements will mainly depend on what you intend to use your computer for. For instance if your going to be running a full desktop environment then your going to need a more powerful pc then if you were just running the console for some simple services. Generally if your going to be running a full desktop environment with multimedia apps open and internet programs your going to need at least a Pentium 500, with 64mbs of ram. Some people would argue that you could run it on a slower processor but if you want some reasonable speed the more power you can get the better. Ram wise I wouldn?t use anything less then 64mbs worth and its normally recommended when using a GUI that you have at least 128mbs. We had Redhat 7.2 running on a Duron 800 with 128mbs of ram and even that was slow occasionally. If your going to be running something less advanced with no GUI then you should be fine with a Pentium 166. The other big consideration you are going to need to take into consideration is hard drive space if you want a full desktop environment and all the programs you need your going to need at least 2-3gbs of free hard drive space just for the programs. You can fit Linux onto around 300mbs of hard drive however this wont be a lot more then a console system. If you install the maximum number of packages on some distributions then you could be looking at 4-6gbs of hard drive space. This is fine if you have a large hard drive but for people will smaller drives you will either have to watch what you install or invest in a more up to date hard drive. Linux should automatically pick up and configure most PCI cards including sound cards, graphic cards and network adapters. The only problems I had was configuring TV cards, Mandrake configured it automatically for me and it worked first time while SuSE and Redhat left me to configure it for myself. ISA cards may need some configuring however it is possible to get most hardware working in Linux. I'm a huge Command & Conquer fan so when I saw the new box set of all the games in the series for £20, i brought it. I'm not a huge fan of serial numbers, those annoying things you always have to enter. 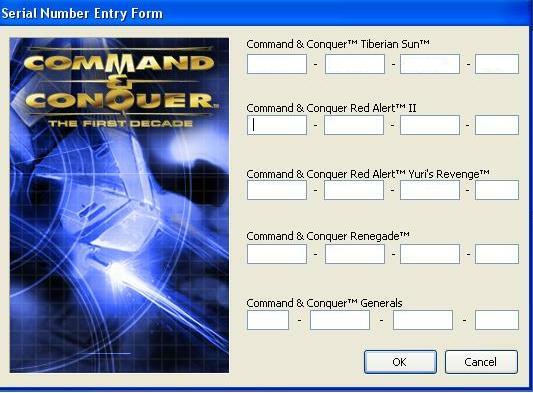 Never the less I put up with them but the Command & Conquer First Decade install took the piss. Then after this I was asked to enter another one!!! The game is still installing, looking forward to playing it. *comments now disabled* - Please do not email me asking for codes. Advertising revenue has been sliding in recent months but has been offset by the weakening dollar. It might be time now to start working on a strategy for increasing advertising through the recession. There are lots of ways to monetise your website including services such as Google Adsense, Text Link Ads, Linkworth and Pay Per Post. The one I want to look at today is TNX. The service is simple to install with a small PHP script to embed into your sites template. From there everything is automated. A cost in TNX points is given per page based on page rank but you can still earn from pages without a page rank. If you have a site with a lot of pages - such as a blog with posts, category pages, monthly archives and pages. If you have a site with a good page rank or have page rank on internal pages. If you do not want to worry about selling advertising, approving adverts or adding/removing adverts manually from your website. Payment can be made at any time to your PayPal account. UK Pension Triple Lock: What is Triple Lock Guarantee? College blocks popular web portal!